The health of our animals comes first with regard to breeding and keeping. In addition to the extensive official controls, our employees also inspect each of our animals twice a day and check if they are healthy. We offer the animals toys and manipulable material as well as a species-appropriate atmosphere. Through the use of modern stable technology, our animals have access to food and fresh, clean water 24 hours a day. Feeding and climate control are monitored around the clock. In the event of a fault, the employee in charge is automatically informed. Weak animals are swiftly separated from healthy pigs and are allowed to recuperate under special observation. Healthy piglets need less medication, which increases quality and reduces costs. Our strict compliance with the animal welfare requirements and prescribed hygiene rules is the prerequisite for the economic success of our company. This includes the subdivision of the companies into separate areas. Access to the animals is only possible after passing through a lock and showering beforehand. Working clothes are mandatory when working with the pigs. In addition, it must be ensured that no contact with other pigs took place during the previous 48 hours. This prevents the transmission of infections and diseases and ensures the health of piglets in our stables. Our pigs are fed with steamed potatoes, barley, wheat and maize. In addition, the animals receive proteins in form of rapeseed meal and soybean meal. The feed is mainly grown in the region and always freshly arranged by the forage master. The animal feed used is subject to strict quality controls. We produce part of the demand for barley, wheat and maize on our own. We buy the remaining feed directly from the producer and distributors in the region. Our storage capacities correspond to about half of the annual demand. Companies that supply us with feed are QS and GMP certified. Each delivery has its own order number and is checked for contamination, appearance and smell. Moreover, we take a sample to examine the dry substance and the pH level. We collaborate with different laboratories to allow constant independent control of mycotoxins and microbiological parameters. Thus, we can maintain our proven high quality and hygiene standards and continue to support the excellent health status of our sows and piglets. Our stables are equipped with an automatic climate control with steady air exchange, which ensures a constant temperature between 18 and 20 degrees Celsius in the sow compartments. This way, our pigs are provided with optimal living conditions, clean air and a comfortable climate. It is very important for us to keep odour emissions as low as possible for the local residents around our sites. Therefore, most of our facilities are equipped with exhaust air purification systems, which do not only reduce ammonia emissions but also odour. For the most part, we utilise the excrements directly at our sites in the biogas plants. In addition to the energy production aspect, the odour is significantly reduced compared to storing the manure and applying it on the fields. We consider manure as an important energy supplier and produce a low-odour fermentation substrate, which is then applied as natural fertiliser to the arable land of the region. Thereby, we close our agricultural cycle. Our piglets are mainly transported by our own trucks. The loading ramps on our three- to five-story vehicles are hydraulically adjustable and adapted to the height of the floors. In order to make the loading as comfortable as possible for the animals, electric drovers are forbidden. We work with driving boards or other animal-friendly means. Ventilation, self-watering systems and temperature monitoring are guaranteed. Through modern navigation, we are able to notify our customers of the arrival of the animals with an accuracy of half an hour. Thus, our piglets benefit from a quick unloading. We have our own workshop and therefore have the opportunity to clean and maintain the vehicles on our own. This gives us the greatest possible control over the hygiene status and the technical condition of our vehicles. LFD Holding operates a total of ten biogas plants with a total output of 6.8 megawatts at its major sites. We use the exhaust heat from the plants to heat the stables and to clean the compartments with warm water. In addition, the piglets in the flat deck can receive warm food. That way, we can minimise the use of fossil fuels. The biogas plants of the sites contribute to the reduction of CO2 emissions for the production of conventional electrical energy by about 22,900 tons per year. In our biogas plants, manure is being converted into electricity together with renewable raw materials. In the fermenters, the fermentation substrates are heated to an optimum temperature and prepared for biogas production. 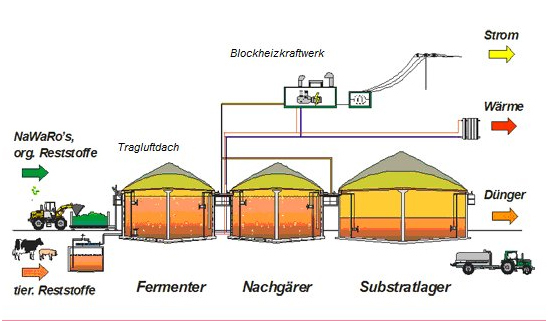 The biogas, which escapes on the surface of the substrate, is accumulated in the upper area of the biogas tank and further processed in a connected cogeneration unit to generate electricity and heat. The remaining substrate after the fermentation process, the so-called digestate, can be used as a high-quality organic fertiliser. Before being applied to the agricultural fields and meadows, the digestate and manure are stored up to six months in covered containers on the plants. The fermentation residues are stored in the containers in a gas-tight manner in order to prevent methane and ammonia from escaping before being applied to the fields. Compared to manure, the fermentation substrate has a much higher dry substance content and a higher fertiliser value. Furthermore, it is almost odourless compared to manure when applied to the fields. The fertiliser demand of the farms surrounding our locations ensures the complete use of the digestate. To further optimise our energy supply, we operate solar energy systems at all sites. Due to their size, location and orientation, our sites offer the best conditions. Every plant is already contributing to reducing the environmental impact of CO2 by 520,000 kg per year, with rising tendency. The responsible veterinarian checks the health status of the entire stock almost daily, at least once a week. The building supervisory authority regularly monitors whether the plant complies with the building permit. The Pollution Control Authority checks through inspections once or twice a year to ensure the plant is being operated in accordance with the operating license. The fire protection officer monitors compliance with the fire protection regulations for humans and animals. The TÜV checks the system every two years in accordance with the Water Resources Act. Every year the electric inspection takes place, that means the professional inspection of all electronic facilities.